MICA held its 25th Anniversary celebration and dinner on the evening of Friday in the presence of students across batches and courses, and faculty members, in its Shela campus. The event was characterized by a mark of respect and reverence to Shri A.G. Krishnamurthy, the founder of the institute, who passed away on the Friday morning at the age of 73. The Director of the institute, Dr. Nagesh Rao spoke about the achievements of Shri Krishnamurthy and his initiative and foresight that led to the formation of India’s only institute specializing in strategic communications management, a name it has lived up to all these years. Cultural performances organized at the football ground on campus, where students gathered in hordes. The event began with speeches from the Director Dr. Nagesh Rao, Mr. SethuIyer and Dr. Shailesh Yagnik, who paid tribute to the great visionary AGK was, and those who knew him personally recounted their experiences to the crowd. The event saw not only students, but faculty and support staff take the stage to exhibit their talents. The crowd cheered on as dance performances, stand-up acts, poetry recitations captured their applause. 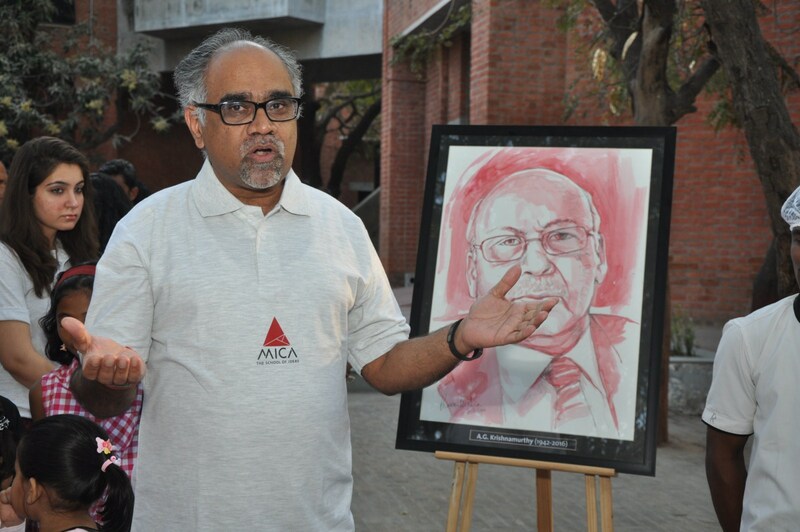 Mr. Pravin Mishra, award-winning filmmaker, painter, newspaper columnist and MICA faculty created and unveiled a sketch of the legendary Shri A.G. Krishnamurthy as a mark of respect and admiration.